Comic Con 2011, held this past weekend at the San Diego Convention Center, has come and gone. This was actually the first time I had exhibited at Con since 2005, so it was nice to actually get back 'in the game' of selling at the big show. 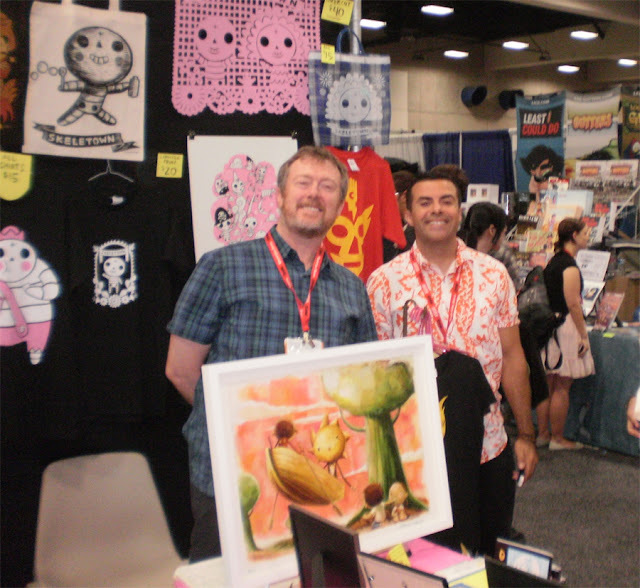 This was Jim's (on the left) first time exhibiting at Comic Con, bringing with him 4 DVD collections of his animated shorts, dubbed 'Ghettomation' for their quick and sparse style of animation. Jim has already stated that he'd back again for next year's Con, most likely with another couple of collections. 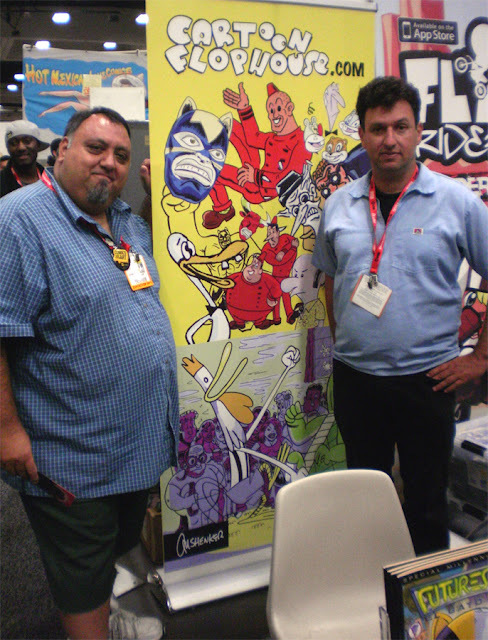 Neil Segura and Ray Mendivil made their first Comic Con appearance as creators of FOREVER FRESHMEN, their comic book title loosely based on their High School years. It's always great to see new talents taking the big steps to set up at the Con. 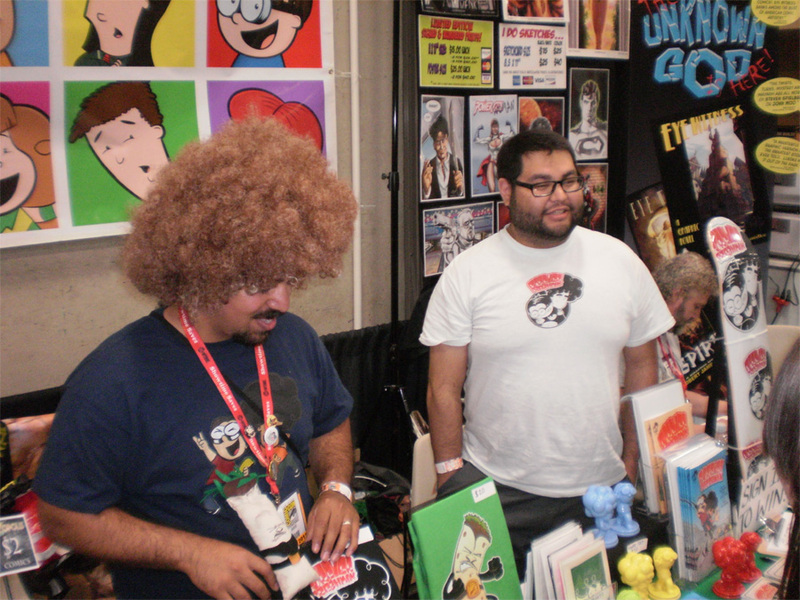 Neil (left) and Ray making a stand for indy comics at the big show! I was fortunate enough to be a guest at the Possum Press/Ultraist Studios table. Blair Kitchen (THE POSSUM) was manning the table on behalf of him and his brother Mike, creator of SPY GUY. When Blair offered me a spot at their table, I knew it was an offer I didn't want to refuse. I have know Blair for about 3 or 4 years, having read his first issue of the Possum and becoming a fan from that first day. 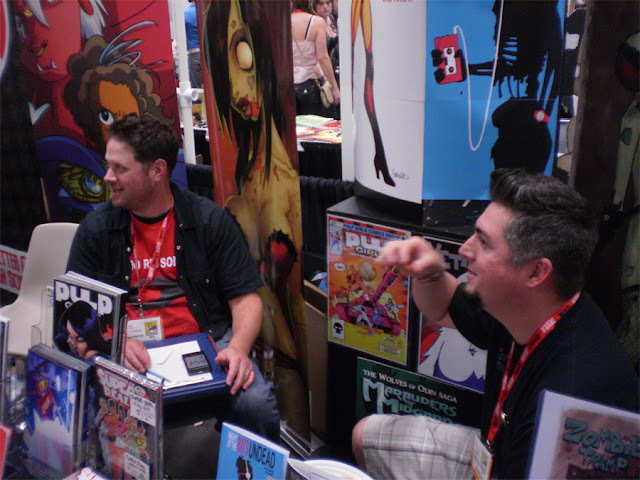 Among the numerous friends/fellow creators I ran into were Jason Martin, creator/publisher of SUPER REAL and Dan Mendoza (ZOMBIE TRAMP). A native of Portland, OR., Jason (left) and I had met several years ago at Comic Con, when we sat as neighbors in the Small Press area (ironically, it was in about the same spot Blair and I were sharing a table!). Jason's become a really good friend over the years, and he and I have actually exhibited together at various other shows. 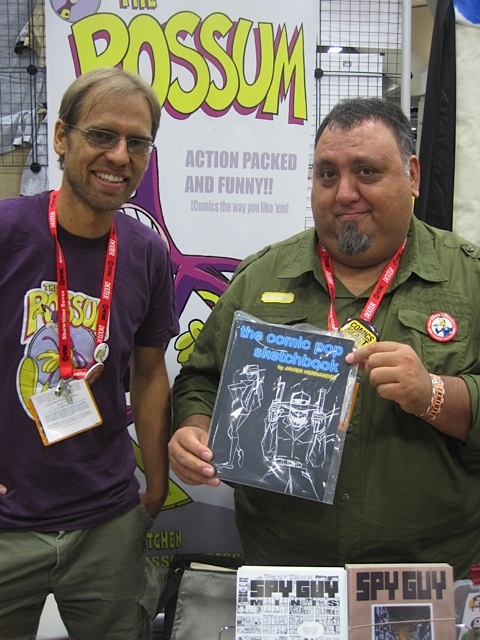 Dan's book is published by Jason, with ZOMBIE TRAMP proving to be a pretty strong seller for an indie comic. Audra and her husband Scott (who was away from the table when I stopped by) hail from Hawaii. They work really hard at building their audiences and getting out to various conventions. It's people like them, and many others, that continue to inspire me to continually work at this whole self-publishing thing. Lots of hard work, and you have to keep finding what works best for your audience, but the rewards to that are unique to self-publishing. Anything goes, and you take pride in your efforts that succeed. Jamie Baker (left) and Rhode Montijo have been sharing their booth at the same location for some years now. They seem like such a fixture of Comic Con! 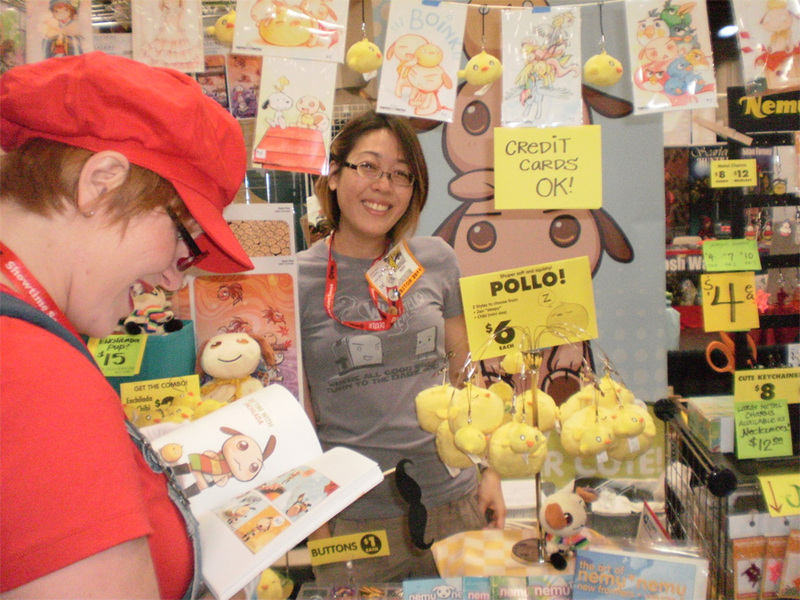 With their various comics and art prints and t-shirts, etc., they're like a corner store in the middle of the hundreds of vendor booths. 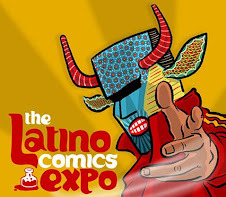 For me, and the people I mentioned above, we attend Comic Con to exhibit our work, make sales, and connect with old and new fans. We create because we have a desire to tell stories, we produce our work to sell and make a living. 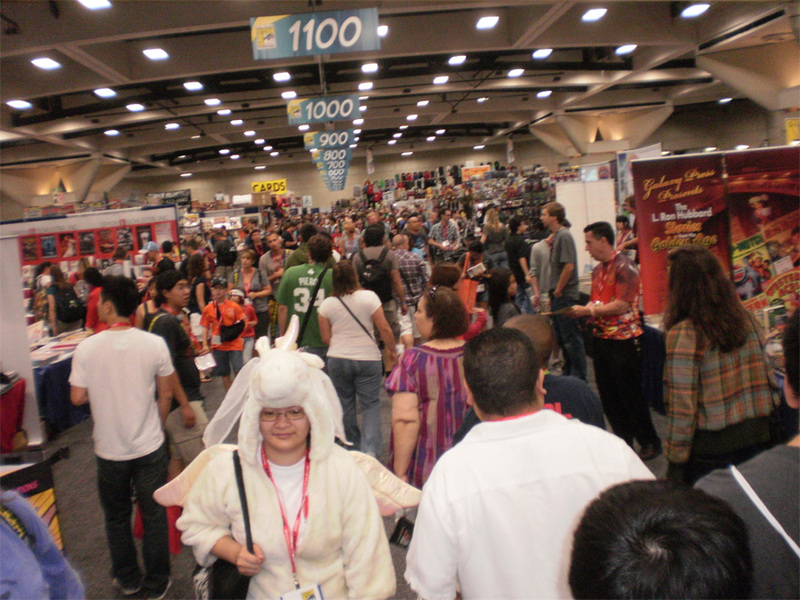 But also, like most shows, Comic Con offers a lot more than just artistic fulfillment and a commercial venue. 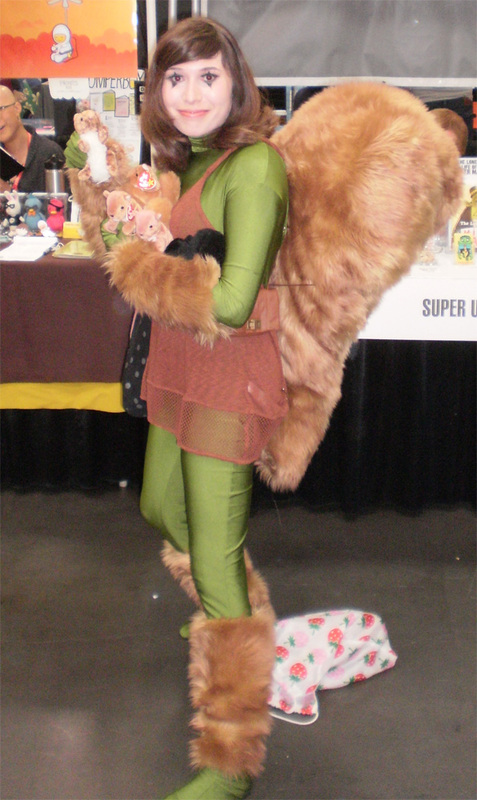 She dressed up as SQUIRREL GIRL! Never heard of Squirrel Girl? Well, she was created by artist Steve Ditko with writer Will Murray for MARVEL SUPER-HEROES SPECIAL #8 (1991). For Friday night's dinner outing, a group of us went to the nearby Seashore Village. Afterwards, we split up and Blair and myself found ourselves at one of the new hotels that's been built in the last few years to deal with the tremendous upsurge in attendance. 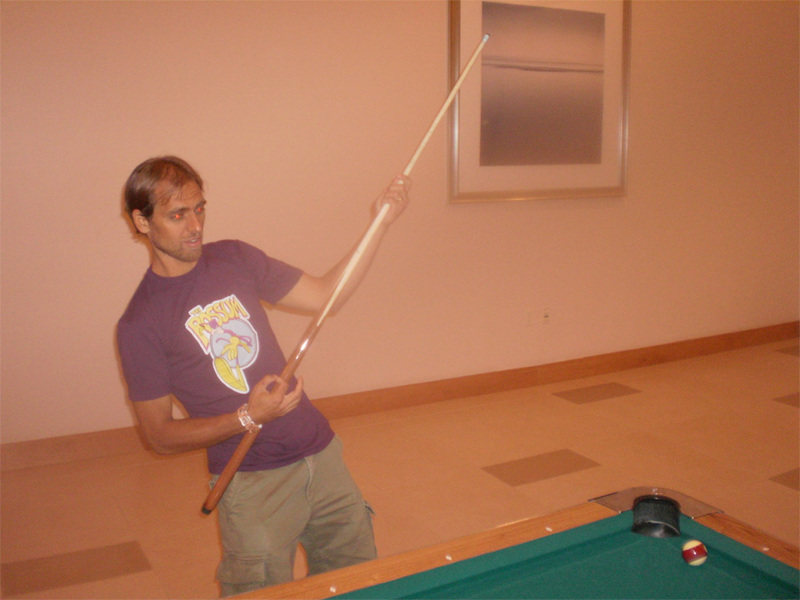 We found a pool table on one of the floors and decided to play a high-stakes game of pool. America vs Canada...with the fate of the world hanging in the balance! In short order, Blair slowly began to outmaneuver me, scoring on his shots while I missed mine by miles. Blair's Grammy-Award air-guitar rendition of "O CANADA". And yeah, he put in those red eye contacts to add to the effect! At one point I had missed a shot and sent the cue ball straight into a pocket. "I saw that!" came the voice from the escalator just overhead. We looked up and see Sergio Aragones smiling at my mishap! Yep, Sergio Aragones of MAD Magazine fame. The world's fastest cartoonist. And faster wit! Saturday at the Con was interesting. Traditionally, in my experience, it's always the busiest day of the whole weekend. More people streaming into San Diego and the convention center than on any other day. My friend Michael Aushenker, whom I've exhibited with at so many other previous conventions, was found holding court at his CARTOON FLOPHOUSE table in Small Press. If Sergio's the world's fastest wit, Mikey has gotta be a close second. Times are always better with Michael around, whether we're doing time at a comic convention or bouncing around the Greater Los Angeles area. Michael's upcoming projects include the first trade-paperback collection of his classic EL GATO, CRIME MANGLER series. I'm super excited about that because not only am I a fan of that gonzo character, I wrote the intro to the furshlugginer collection! On one of my walkabouts, I ran into Michael once again and a lady named Mayra. Like the gallant knight I am, I introduced myself to yon damsel. Then I walked her over to my table where she was nice enough to buy my movie and a comic! If flattering such ladies to buy my stuff needs this approach, then I guess I better stock up on lip balm for next year! A word about 'next year': I'm very grateful to have been invited by Blair to have shared a small spot at the table. 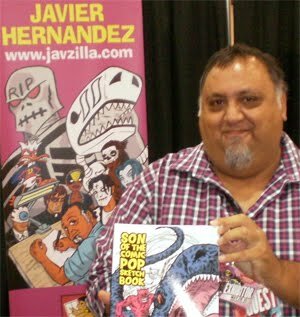 While I've missed exhibiting at Comic Con for several years, I was eager to get back behind the table and do the 'Big Show' once again. I noticed a couple of things. One: Not having my banner with me behind the table makes a huge difference. As a last minute invite, I certainly didn't want to clutter the table with my accessories, so I left it back home. But it does show me that people really do look at the large image and decide right there and then if they're at least curious to check out the table. Two: I had several people over the two and a half days I was set up comment on the fact that they had seen the EL MUERTO movie. One person didn't like it (no problem, at this point I'm totally fine hearing all reviews of the film). One didn't finish seeing it and wanted to rent it via Netflix. Another liked it enough where he dressed up as El Muerto for Halloween. I asked him to please send me a photo if he could find one. Another guy walked by, saw the DVD, asked what it was about, bought it and whisked off! That was the quickest sale I ever made, outside of a button. Three: This last opinion of mine if just my own personal point of view. Saturday was by far my least productive day in terms of sales, a far cry from the traditional sales patterns for this show. I heard from other self-publishers that they also experienced slower sales. A retailer friend of mine, whose been selling back issue comics for well over a decade, told me his sales were not keeping up with his expense of doing the show. So, if there were record number of people in the convention, where were our sales? I'm guessing that many of the new people attending Con are there for the various movie and TV-sponsored panels and presentations. Also, with the ever increasing presence of video game and toy companies, perhaps the 'traditional' comic buying fans are getting 'squeezed' out by the new crowds? I can't sell stuff to people who aren't interested/looking for/there for the type of things I make. Let me share a link here, for those of you who are interested, in a newsletter by retailer Chuck Rozanski, President of Mile High Comics. He's one of the world's largest retailers of comic books, and has been attending Comic Con for 38 years. I think he's more than qualified to speak on the status of Comic Con and it's trends and future plans. Some sobering information in his report, that's for sure. I will say that I am not harboring any anti-Comic Con sentiments. They also put on the Alternative Press Expo in San Francisco and later this year I will be exhibiting there for my 14th year in a row. But Comic Con is an expensive show to exhibit at (I'm including travelling/lodging expenses as well) and we each have to make our own decision as to whether we can afford to do the show every year. And of course one has to be creative in making one's presence known at Comic Con. I'll say this, my experiences at Comic Con, first as a fan then later as an exhibiting artist, are always full of great, great memories. 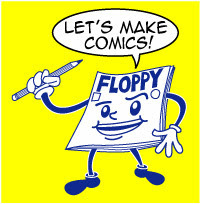 I've made some good friends here, have gotten many new fans, met some legendary creators from yesteryear. 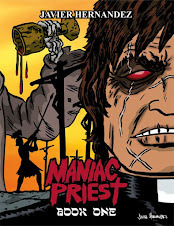 We held our panel for the EL MUERTO movie here, and in 2007 screened the film here as well. This is the biggest comic book convention in the country, bare none. I'll have to think about my plans for Comic Con 2012. And soon, as exhibitor space sells out way quicker than it did a few years ago. But I had a great time this year. And I expect I'll have other great Comic Cons in the future. A volunteer for the convention stopped by the table and asked Blair and I to sign his volunteer t-shirt. See the Possum and Muerto drawings? I've always been a fan of the SPY VS SPY strip, from the pages of MAD Magazine. 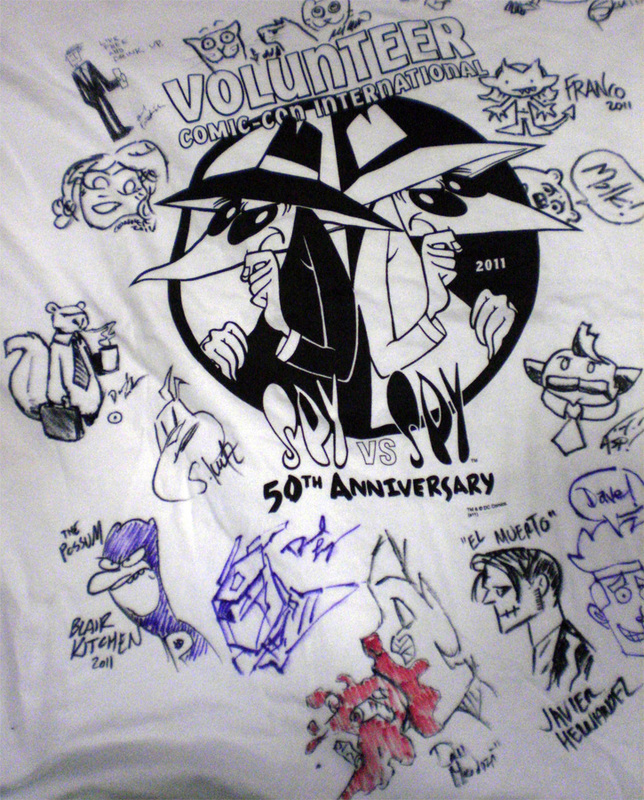 To be able to sign it, to add my character to that SPY VS SPY Anniversary commemorative souvenir, that's such a blast. As a comic book creator myself, it's just another of those little memorable, magical moments that make up yet another Comic Con for me. San Diego Comic Con 2011...Here I come! 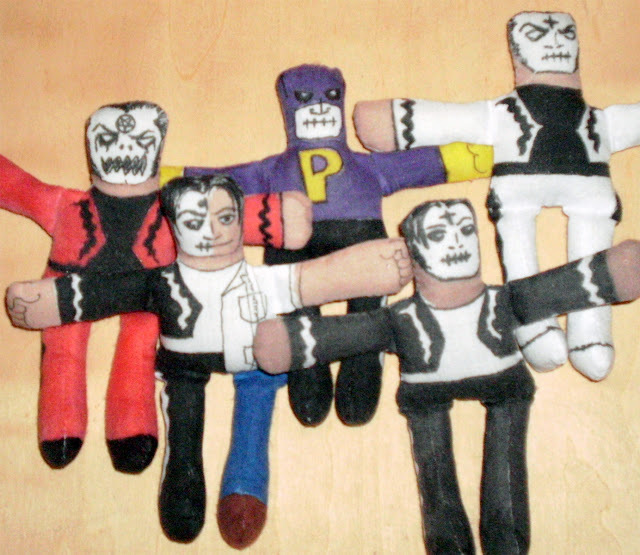 And I'll be travelling with some little friends of mine.... EL Muerto Mini Sketch Dolls! 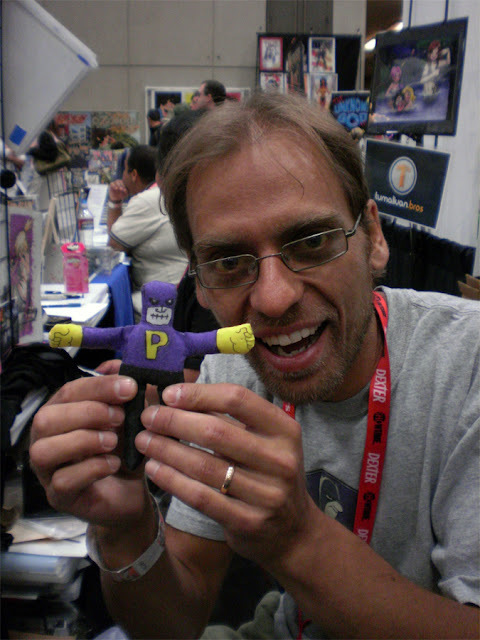 It's been several years, but I will indeed be at the San Diego Comic Con this week. I'll actually be there on Friday and Saturday. Look for me in the Small Press area, at table K-05 (The Possum Press/Ultraist Studios table). I'll be hanging out with my friend and fellow self-publishing cartoonist Blair Kitchen, creator of THE POSSUM! I've blogged about Blair here in the past, talking about his Possum comic, easily one of my favorite comic books being produced this century! In 2010, I finally met Blair and his cartoonist brother Mike Kitchen at WonderCon in San Francisco. These guys each produce top-level work, and often keep up a pretty rigorous traveling schedule as part of their self-publishing efforts. Mike won't be making it out to San Diego, but Blair will have all the Ultraist Studios product at the table. I actually did an interview with Mike last year on my old podcast, JAVILAND. Here's the link to my podcast's blog with links to the interview. And there's also a link to an older interview I did with Blair Kitchen on PLANET COMIC BOOK RADIO, an earlier podcast I used to host. As for them mini sketch dolls I mentioned at the beginning.. .Yes, I have made some new ones just for Comic Con. El Muerto, as well as some variants, like Diabolico El Muerto, El Muerto/Diego de La Muerte, even a super special mash-up Possum Muerto! So new, so secret, even Blair doesn't know about it!! These 5" sketch dolls are all hand-drawn/colored by yours truly. It's like buying a 3 Dimensional sketch from me! Looking forward to hanging out with Mr. Kitchen, as well as meeting up several friends of mine, some of who are making their debut Comic Con appearance as exhibitors. Hope to see some of you there!